Co-op Power will tailor a solar solution to fit your needs and your resources. The best solar solution for homeowners or business owners with a good solar site is to build and Own Your Own Solar Array. If you own your own array, you can save 40-50% off the price of your electricity over the next 25 years. You'll pay for the system in the first 5-8 years and then have "free" electricity after that. The Massachusetts Solar Loan Program makes this option affordable for homeowners with limited resources. The best option for non-profits is to own your system over time. Sign a Power Purchase Agreement (PPA). Co-op Power installs a solar system on your property with no money up front. You purchase the power generated by the array monthly for 5-7 years at a discount. After 5-7 years, you purchase the array at a fraction of its original cost. The next best option is purchasing panels and Co-locating Your Panels in a Shared Array at another site. 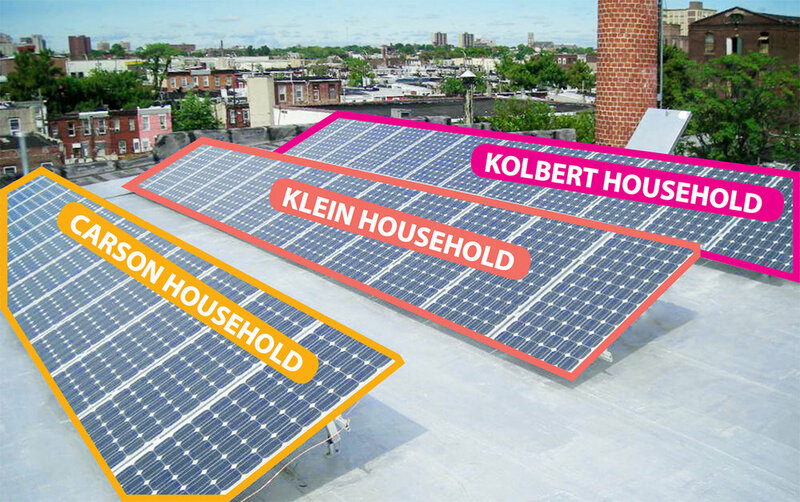 (If you're part of multi-unit housing, you can all purchase panels and co-locate them on your own property.) You can save 30-45% off your electricity over the next 25 years. You'll pay for the system in the first 7-12 years and then have "free" electricity after that. The Massachusetts Solar Loan program makes this option affordable for homeowners or renters with limited resources. Next best is a Community Solar Subscription that saves you 10-15% off your electric bill. Co-op Power builds a cooperatively owned array and you sign up for a share of the array's production. Community Solar arrays are built on an ideal site, with great solar access, and the production is applied to electric meters located within the same utility in the same geographic area as the array. Most people can't build their own solar array. They rent, or don't have much money, or don't have a good solar site. Community Solar is the best way to bring the benefits of solar to everyone. Here's a short video with information on how the Community Solar Subscription program works. Community Solar Subscriptions require no-money-down and you can opt out with six months notice. Owning solar yourself, or owning it cooperatively through Co-op Power means both the financial benefits and the clean power return to our community. Whoever builds and owns a solar array receives valuable state and federal financial incentives and the savings on your electric bill. Cooperatives are a legal structure for people to own assets together. Co-op Power and our members either build and own Community Solar arrays right from the start or we create a path to ownership over time, partnering with investors and developers to bring solar to our region. If Co-op Power develops the projects, the systems cost 5% to 20% of the their fair market value to buy back once the investors have been paid back after 5-7 years. If Co-op Power partners with a developer to build system for us, the systems cost 100% of fair market value to buy back after ten years. Check out our FREQUENTLY ASKED QUESTIONS page for details about how Community Solar Works.